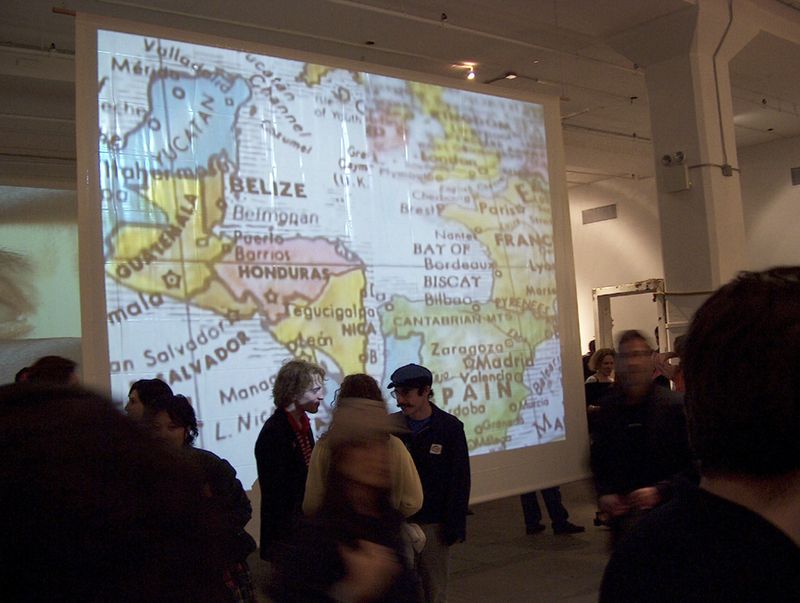 Divided in two, each side of the screen features a globe turning quickly and slowing to a halt. Each time it stops, a random encounter is created between two geographical areas. Tension is thus generated between the representation of reality in each of the two screen parts and the new place created by the juxtaposition of the two, attesting to the potential of border changes, migration of nations, the movement of continents, etc. The work touches upon questions of immigration, occupation, colonialism, globalization, terrorism, arbitrariness, and play (it contains an element of a casino game). The straight dividing line created by the split screen alludes, at times parallels, to straight borders marked in the course of history throughout the world (such as borders between states in the United States and between countries in Africa). The work elicits questions concerning knowledge and orientation (or the lack thereof), confronting us with the realization that between every two spots in the world there is always some kind of connection (whether economic, political, geographical, historical or cultural). If we do not know what that link is, it is only because we, as viewers, lack knowledge about it. Much attention was devoted to the formal and color accord of the geographical combinations, but the idea of the "unexpected" encounter is nevertheless convincing.